I have been busy making many Christmas gifts the passed few days. I haven't even looked up from my craft table to clean, cook or do anything else. LOL.. anyway, I wanted to show you a few things that I have been making. I didn't do tutorials for these items because I have just been too busy to take photos. I've been working on one thing and while that dries, I start another item. Some items I haven't even taken a photo of yet haha! I feel like an elf at Santa's workshop. I love it, I think the best gifts are truly home made and I love it when I get something that someone made so it's wonderful. For the first item, I made something for my daughter. She is always giving me these things that she finds or has around her house that she thinks might be cool for me to use or alter in my crafts. 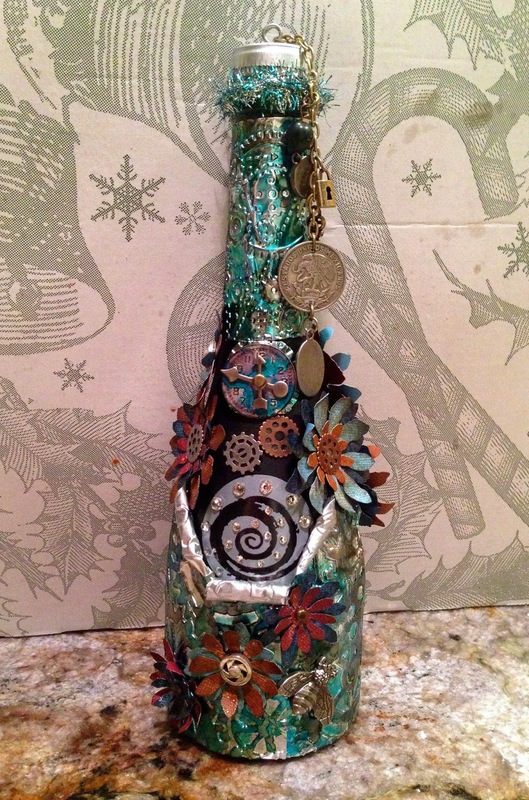 She gave me this really nice bottle (I think it was a liquor bottle but since I don't drink I'm not sure) I wanted to alter this for her for Christmas. She loves steampunk so I went with a sort of steampunk look for this. The only part of the bottle I show is that really cool white swirl on the front. I also added gems to that part. The bottle was white/clear and I painted the inside with black acrylic paint. Some of the foo-dads hanging from the cork are a few items that she has given me to use. 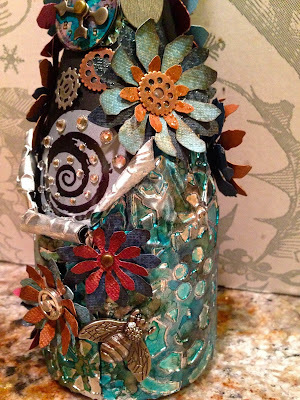 I used metal foil tape for the base and neck of the bottle and made some tattered flowers to add here and there. I also made an art journal cover for my daughter in law, her birthday is two days before Christmas so I will be giving this to her for her birthday. 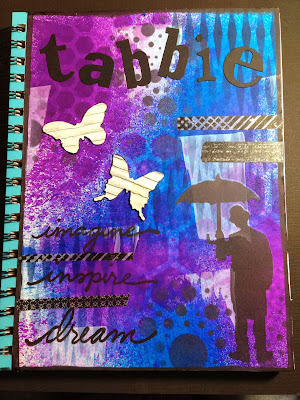 I used a lot of stenciling and her favorite colors in the Dyan Reaveley sprays. This was a fun cover to do and I really love the boldness of it. Thanks for stopping by, I hope you have a wonderful day!! 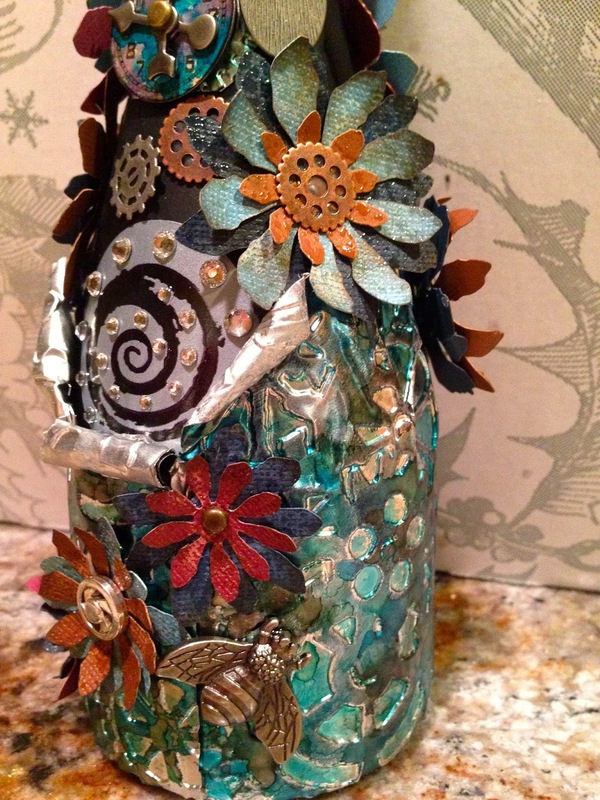 Both projects are extraordinary, Claudine, but, like your daughter, I am partial to steampunk! I love all the details, thanks in part to the wee gifts that your daughter accumulates and passes on to you. Lovely gifts for your daughter and daughter-in-law! Gorgeous projects, I am sure your daughter will love the bottle. Great gifts. I'm sure they will love them! LOVE that bottle! What a cool cool gift! Wow, really beautiful. I love all your details. Thank you for joining us at Simon Says Wednesday Challenge ! Wishing you a very happy Christmas and best wishes for the New Year !